SPRING,We are born and in the newness of life there is innocence as we grow through into adolescence (Ecclesiastes 11:9-10). 9 Rejoice, O young man, in thy youth; and let thy heart cheer thee in the days of thy youth, and walk in the ways of thine heart, and in the sight of thine eyes: but know thou, that for all these things God will bring thee into judgment.10 Therefore remove sorrow from thy heart, and put away evil from thy flesh: for childhood and youth are vanity. Summer,We establish our life by marrying and have children.Then soon learn of the patience our parents had as our family starts to grow.Careers are busily being made (Psalm 128:1-3), Blessed is every one that feareth the Lord; that walketh in his ways.2 For thou shalt eat the labour of thine hands: happy shalt thou be, and it shall be well with thee.3 Thy wife shall be as a fruitful vine by the sides of thine house: thy children like olive plants round about thy table. 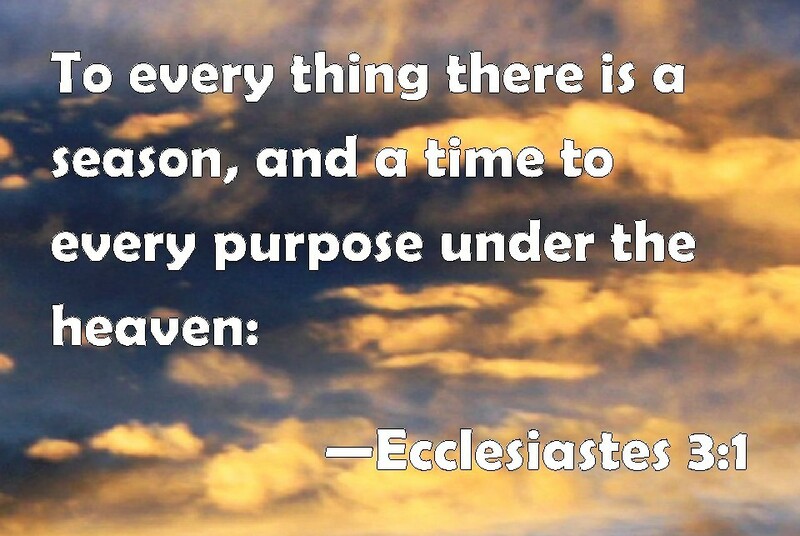 (Ecclesiastes 5:18-20). 18 Behold that which I have seen: it is good and comely for one to eat and to drink, and to enjoy the good of all his labour that he taketh under the sun all the days of his life, which God giveth him: for it is his portion.19 Every man also to whom God hath given riches and wealth, and hath given him power to eat thereof, and to take his portion, and to rejoice in his labour; this is the gift of God.20 For he shall not much remember the days of his life; because God answereth him in the joy of his heart. FALL,We have the work of our life established for the provisions in taking care of our family,and now have grandchildren to enjoy!(Psalm127:3-5). 3 Lo, children are an heritage of the Lord: and the fruit of the womb is his reward.4 As arrows are in the hand of a mighty man; so are children of the youth.5 Happy is the man that hath his quiver full of them: they shall not be ashamed, but they shall speak with the enemies in the gate. WINTER,We realize just how fast the years have passed,but as christians we are aware of the many blessings we have been given throughout the years that God has allowed us to live!Time and chance happens to us all,and the sum of our life is measured not in our accomplishments but in the love and kindness we have shown to others.The winter of our life does not have to be a sad time and to think this is all there is,for the christian knows to be absent from the body is to be present with the Lord! (2 Corinthians 5:1-9). For we know that if our earthly house of this tabernacle were dissolved, we have a building of God, an house not made with hands, eternal in the heavens.2 For in this we groan, earnestly desiring to be clothed upon with our house which is from heaven:3 If so be that being clothed we shall not be found naked.4 For we that are in this tabernacle do groan, being burdened: not for that we would be unclothed, but clothed upon, that mortality might be swallowed up of life.5 Now he that hath wrought us for the selfsame thing is God, who also hath given unto us the earnest of the Spirit.6 Therefore we are always confident, knowing that, whilst we are at home in the body, we are absent from the Lord:7 (For we walk by faith, not by sight:)8 We are confident, I say, and willing rather to be absent from the body, and to be present with the Lord.9 Wherefore we labour, that, whether present or absent, we may be accepted of him.